Beyond Blackjack: what are different types of 21 games? Love Blackjack? Who doesn’t? Well, maybe people who are bad at math and have trouble counting. But if you’re all about the number 21, chances are you race over to the Blackjack table the second you head into the casino, online or off. 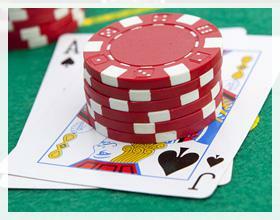 But did you know Blackjack is only one of many types of 21 games? There are loads of them. Some are only available online. Others can only be found at certain land-based casinos in specific countries. Here’s a look at our top favorites. This is the Blackjack you know and love, except instead of a 6-deck or 8-deck shoe, there’s just one. This is a card counter’s dream because it’s way easier to count cards, especially if you’re a newbie card counter. For that reason, you won’t find too many single-deck Blackjack games around. But if you do manage to find one, jump over and play it right away. If you hate waiting for the dealer to shuffle decks, you might want to step up to a continuous shuffle Blackjack table. Instead of dropping the cards into a stack of dead cards at the far right of the table, the dealer drops it back into an automatic shuffle machine that continuously shuffles the cards. That means, theoretically, you can be dealt the exact same King you were just dealt the hand before. While this type of Blackjack game saves time, it’s horrible for counting cards because most of the cards are always in play. Instead, look for the tables that shuffle the cards automatically but have the dealer remove them from the shuffler and place them in a shoe. Spanish 21 is a lot like Blackjack, with a few exceptions. First, while most casinos will have the dealer hitting on soft 17, Spanish 21, for the most part, forces the dealer to stand. And perhaps the biggest difference is the number of cards. Blackjack uses a 52-card deck of cards. Spanish 21 uses a 48-card deck—all tens have been removed. And here’s the best part. You’ll win with a 21 even if the dealer has 21. So if you’re tired of seeing a push when you have the seemingly best hand in 21, you’ll love Spanish 21. This one is a lot like Spanish 21 with one important twist. The dealer doesn’t receive a hole card. You need to make your decision with only one card in the dealer’s possession. He gets his second card after each player has decided to stand or after they have busted. You’ll find this one primarily in Costa Rica. Like Pontoon, the dealer gets his second card after all player decisions have been made. There’s also no such thing as a Blackjack. If you get an Ace and a 10, that’s called getting 21 points, not hitting a Blackjack. But here’s where it gets cool. You’ll get paid out more if you hit a three of a kind or a straight flush. And it doesn’t matter if your cards jump over 21. Three eights will get you 3:1 payouts if they’re unsuited and 5:1 if they’re suited. Straight flushes pay out 3:1, and straight flushes that total 21 pay out 5 to 1. Like these variations of 21 games? Palace of Chance has lots of these and more. Check them out now. Also, click here for a very cool infographic we shared with you a while ago, it will certainly come in handy!